Sometimes we don’t realize how much words can affect one another. I’ve often heard people say things their Art Teachers or others told them way back in school that made them think they could not create art and some never even venture back into it because of the words they heard when they were young. Now we have a whole new forum to teach with online classes and this encourages people to try their hand again from the comfort and safety of their homes. You don’t even have to share your artwork if you don’t want to, though I highly recommend it to get the most from the experience. This weekend I found out that I went to the same high school as one of the other Artful Gathering Instructors-what a small world! Even though we weren’t there at the same time, we both hung out in the Art Department and one of the same teachers was there during both of our years. I loved my art teacher Miss Carroll. She was beautiful and talented and made you want to be an artist just like she was. She was also hard on you if she felt you weren’t living up to your potential. Art wasn’t an easy A in her class. I in fact got a B one quarter because I was goofing off and not trying very hard. I was devastated when I received that report card. I felt not only like I’d failed at my favorite class but also I’d failed Miss Carroll. Believe me, I didn’t let that happen again! Finding out that Riki Schumacher was also from my high school caused me to dig out my year book and look at what my Art Teacher wrote in it. Encouraging words to continue pursuing art, but more importantly a push to go farther. I was fortunate to have encouragement for most of my life; if not always to pursue my dream of being an artist, surely encouragement to be creative. It always makes me sad to hear of those who have had a bad experience in their early creative years, but it’s also so wonderful to see them bloom later when they rediscover their artistic side. 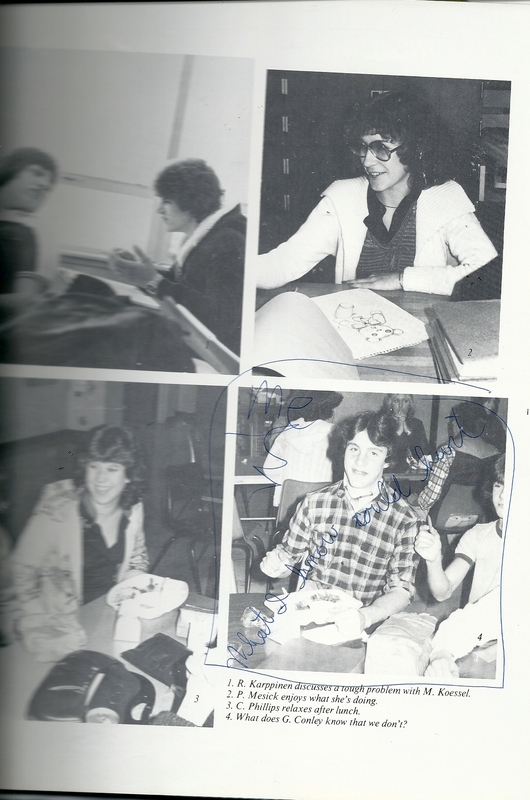 Now don’t laugh (love those glasses) but that’s me in the upper right hand corner as a sophomore. It’s the only candid shot of me and what am I doing? Drawing of course! 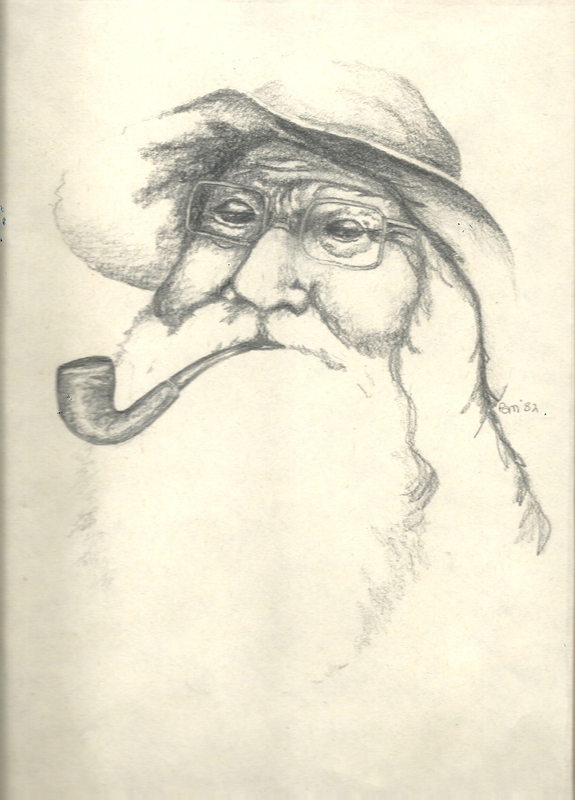 One of my sketches from way back then. I don’t have many, how often do you wish you’d kept things like that?! I know I do. I find there is negativity even today, not just back in the school days. I dabble around drawing, mixed media, art jounalling… and there are people who tell me that I do weird things, and screw up their faces and look at me like I have some sort of strange disease! But, i figure it is their loss!! Hi Pam, what you say is so true. I wish we lived in a place where children’s souls were nourished with positvie words and actions and that all teachers were like Ms. Carroll. It is even worse when the negativity is coming from someone at home. Thank you for mentioning late bloomers, I happen to be one of them. I was never encouraged to follow any of my dreams and even was discouraged, making me feel that there was no use trying. Adults don’t realize the impact words have on young ones. Especially coming from a parent. You believe everything they tell you. Thanks, Pam. I’m so glad I bought that “Workshop” magazine and fell in love with your art. I never took art in high school because I had no idea how to draw and thought one needed to already be able to draw to take art! Well when I was approaching age 60, my son and sister finally convinced me to try. Both have been very encouraging since. Pam, I have copied many of your faces, I must admit. But it was very nice to hear the both say just the other day, that the faces I now draw seem to be my own style! I really appreciate your classes and postings. What a beautiful tribute to your teacher. It is inspiring to know people who play their role in life with integrity and great respect for others. Thank you for being one of those people, too, Pam. Your words of encouragement are healing and empowering. What a wonderful post Pam. And you are one of those teachers who is inspiring and encouraging. When I was in college I took a beginners watercolor class. The teacher was a well-known artist in our area. The class consisted of his followers except me (at 38 years old) and a younger man. Everyone except me and the other student were well accomplished artists and the teacher spotlighted their beautiful works every class. Homework consisted of painting something to be shown in the next class…no techniques, no encouragement, just criticism of the other student and my art as we had to show it in front of the class. We both dropped the class within weeks and I threw all my paint and brushes out never to paint again. Until this last year, 2011, at 49 years old. Thanks to YOU and other wonderful artists and teachers who have encouraged me to reach farther, try new things…I’m even drawing! Thank you for being YOU, so positive and encouraging. Hopefully if other teachers read your article and comments they too can remember how words and actions can affect their students. you are right pam – i’ve had one of those experiences in an art class and it was a comment that haunted me for years. thankfully i was able to move past it but it took a long time. now i’ve learned we are independent of the positive AND negative comments of others which freed me to make art to satisfy me. i’m so happy you are always positive and kind in your classes – such a wonderful influence to so many. way to make your mark in the art world! i’m proud of you!